The alleged lopsided appointment had Ndasule Moses, Lawan Mamman, Galadanci Imam Najib, and Adeleke Adebayo Rafiu, as its nominees. The Senate refused to confirm Buhari’s EFCC nominees after the Senate Committee on Anti-Corruption and Financial Crimes presented to the Plenary it's finding on the nominees. The lawmakers who noted that South-East and South-South were not represented in the Commission, added that only one of the nominees was from the South-West, while the Acting Chairman of the EFCC, Ibrahim Magu, is from the North. He argued that “It is important that we include all regions in governing roles and in the fight against corruption, as it involves us all. However, Senator Ahmad Lawan advised the lawmaker to pass the nominations as presented but noted that all geo-political zones needed to be represented. 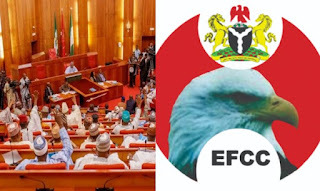 The Senate thereafter went into Executive Session, which lasted for 25 minutes At the Executive session, the Senate agreed that the confirmation of the EFCC nominees should be suspended for further legislative input.